We’ve lived in Boise for a year now (already! ), but we still haven’t done much exploring of the state. So yesterday, we took the opportunity to drive through the countryside and meet some new dog folks. 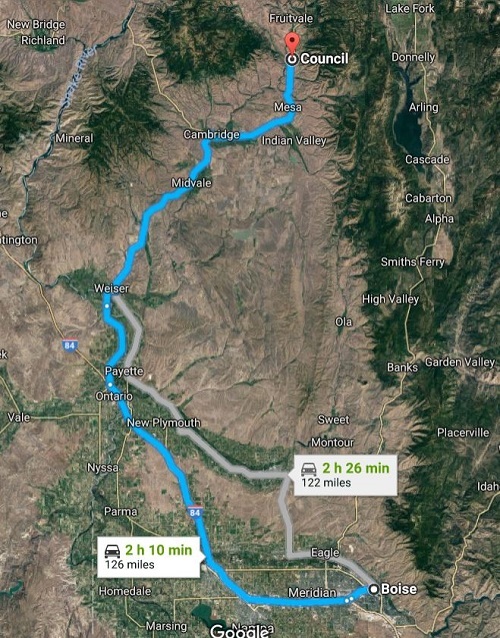 The trip to Council, Idaho took just over 2.5 hours. Council isn’t quite that far from Boise, but Ann and Gary live about a few miles from there, all on gravel roads. We took the I-84 route for speed, but if we’d had the time, I’d have preferred the route through New Plymouth and Payette, as it’s just plain prettier than the interstate. But we got there, and met the folks, their guests, and their myriad dogs, mostly a collection of Cesky Fousek (Chess-key Foe-sek). 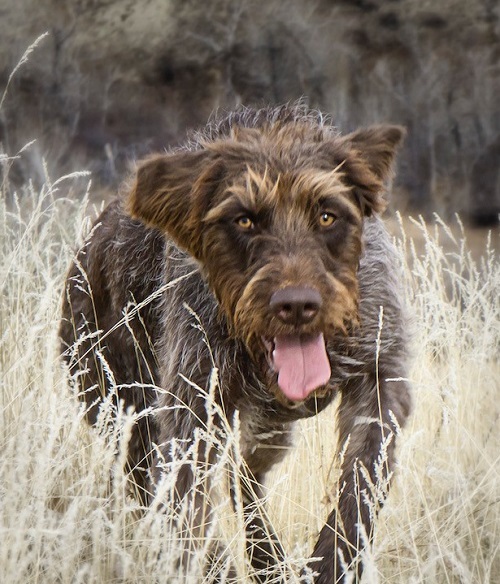 These dogs, also known in the USA as Bohemian Wirehaired Pointing Griffons, are a coarse-coated versatile hunting breed, developed in the Czech Republic. According to what we’ve read and people we’ve talked to, the Fouseks retrieve happily and love water, as well as point. 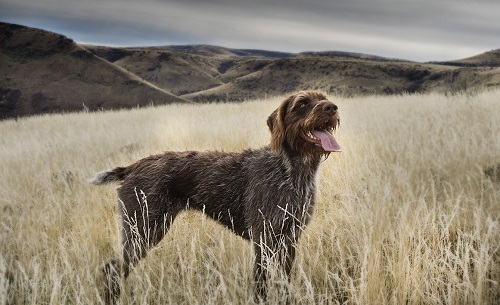 They certainly seem suited to Idaho, particularly with that wirehaired coat. Sure, they picked up a few seeds and cockle burrs as they roamed Ann and Gary’s property, but the debris just pulled right out, with very little effort. Their dogs seemed just like descriptions of the breed that I’d read: friendly, happy, and very responsive to their people. 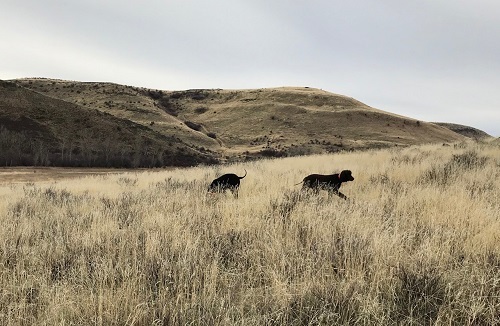 We brought Tooey and Carlin with us, and they, along with two Cesky Fousek and one Cairn Terrier, went for a nice long walk through the fields, into a pond, and then, to Tooey’s delight, to the Weiser River, where they all (except the Cairn) went swimming and retrieved sticks. It was a great day. I know that because we were all tired when we got home, and ready for some hot tea and early bed. 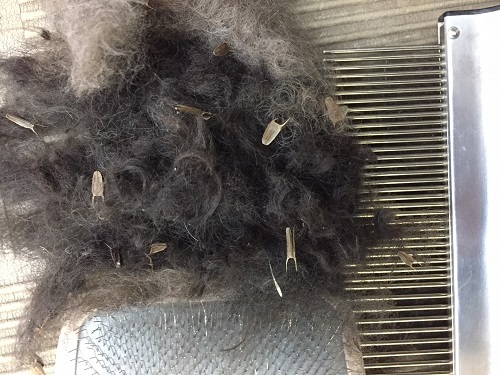 Of course, that was delayed for an hour or so, because unlike the Fouseks, the two IWS had to be brushed and combed to get all the debris out of their coats. When I first arrived in Boise, I went out to find the local leash-free dog parks. I was very disappointed to learn that the city leash-free parks prohibit intact male dogs, so I went off to look for other alternatives. Turns out that there is a large park called the Military Reserve that has a off-leash area and many off-leash trails. But when I arrived in the parking lot, two very friendly dog owners warned me about goat heads. 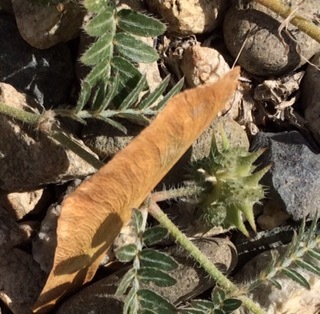 It’s a plant, apparently, with thorns that can push deep indents and even holes in shoes and dog feet. 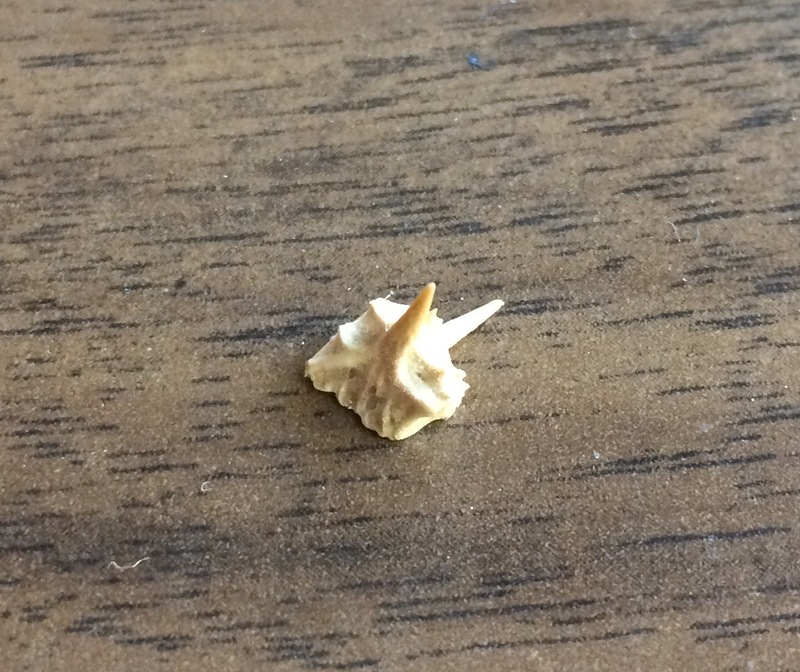 One of the dog owners showed me the bottom of her boots so I could see how deep the thorns go. Yikes! We looked around at the reserve to see if we could see a sample of the actual plant, but I didn’t actually see one until I visited a friend’s house yesterday and found one growing in his back yard. 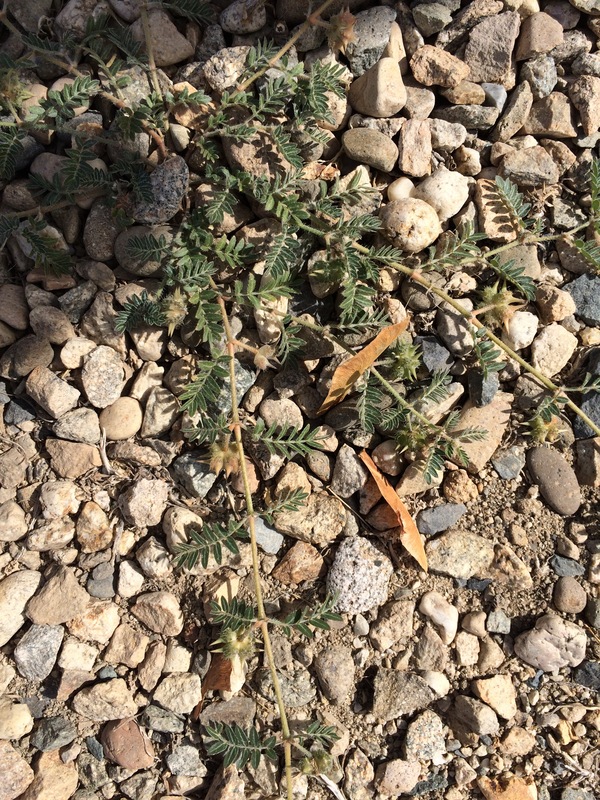 It’s a low growing plant that has seed pods with pairs I’d 1/8″ inch thorns. You can see a green seed pod in the lower right quadrant of the photo below, just under the long brown tree seed. The green ones are reportedly softer and not quite so painful. But here’s a dried one I just pulled out of my shoe. So now, on top of the ticks I already knew about, and the cheat grass that I haven’t seen yet, now I have to worry about goat heads. It looks like I’m going to have to clip my dogs even shorter than I thought, just so that I can examine them closely for all these small, but not insignificant, complications. So far, I think Boise is beautiful. But it doesn’t offer the tick-, cheat grass-, goat head-free luxury I left behind in NW Oregon. We’re moving to Idaho soon. Boise, to be specific. There are (gasp!) ticks in Idaho. I hate ticks. I’ve had ticks on me, and they are just gross. Makes me shudder just to think of it. So, even though we’ll use a tick preventive of some sort on our dogs, I’ll still need to check them regularly for ticks. Checking for ticks in a long IWS show coat is just not my idea of fun. I know many IWS folks live in tick country, so this may not be a particular problem for them, but like I said, I really hate ticks, and I want to make looking for them as quick and easy as possible. Plus, you really need a long coat on an IWS only for conformation shows. There aren’t that many IWS in Idaho. There are a few, but I haven’t heard that they participate in conformation. The next shows in Idaho are in the middle of next month, but I don’t think we’re going to be settled enough for me to be able show Carlin, even if there were going to be other IWS to compete with. And then there’s the fact that I’ll be moving to start my new job a couple of weeks to a month before Russ is able to move. That will leave him responsible for the weekly combing, not one of his favorite activities. Keeping the dogs fed, the poop picked up, and the nails trimmed will give him enough dog chores to do. Plus, he’ll be busy and distracted with sorting and packing up the house here in Oregon. So I decided to cut both my dogs’ coats short. Short coats will just make life a lot easier. Tooey’s coat was already pretty short (that’s her pre-trim length in the photo above), but Carlin had the long leg, long topknot, and long ear coat. 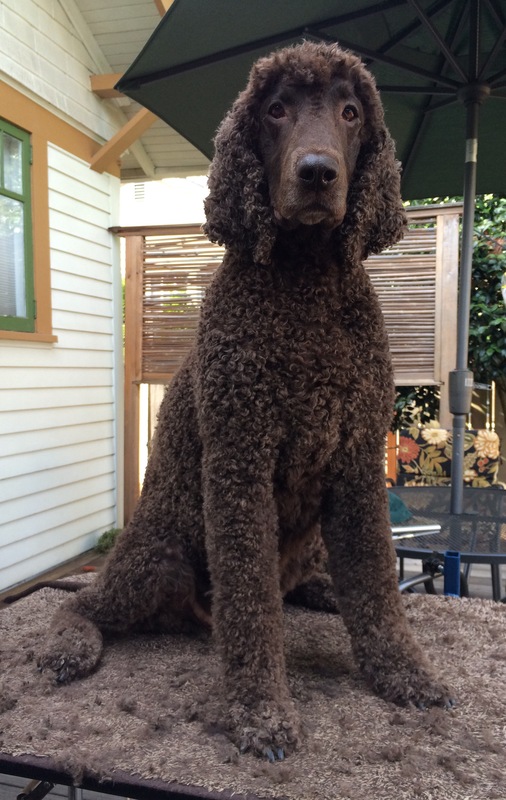 Plus, he was looking a bit woolly after his week away at the boarding kennel while Russ and I were off on our boating trip. So, off it came, down to about 5/8″ all over, with extra on the topknot and ears. Both dogs were pretty patient with the whole procedure, Tooey more than Carlin. As long as let them off the table occasionally so that they could properly tell off the squirrels, the dogs were happy to cooperate with me. 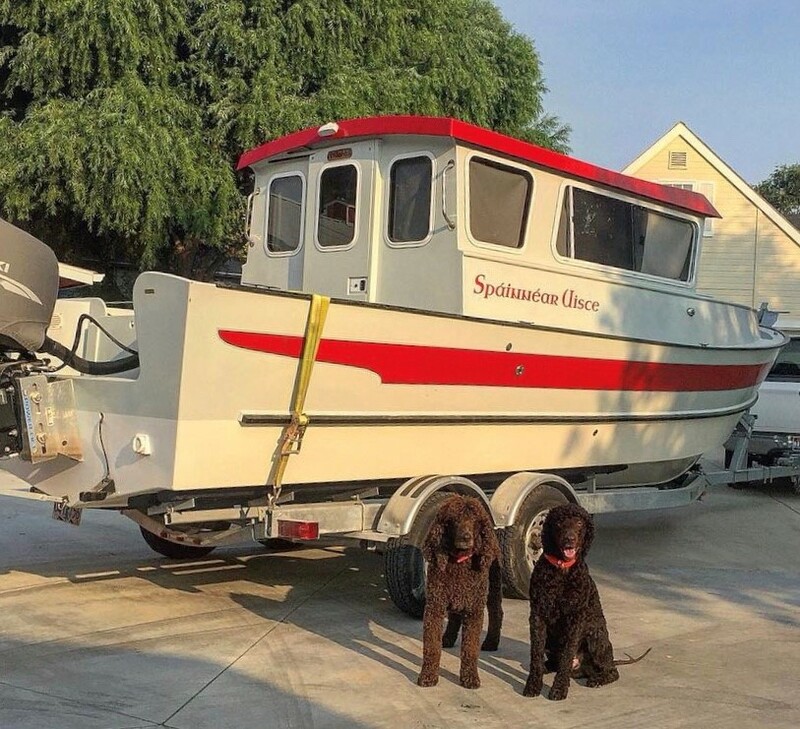 Good dogs! On to the next adventure. It’s been so hot. Today it’s a humid 90 degrees F, and yesterday was worse. I had been growing Tooey’s coat for possibly showing her in the Veterans class at IWSCOPS Specialty in a couple of weeks, but then various things happened, and I decided I couldn’t deal with two dogs at the specialty. So, we decided Tooey would stay home with Russ. And then we got this spike in the heat, and Tooey was clearly not liking it one bit. She has the coat of a duck hunting dog: a thick under coat along with a thick outer coat. Sometimes she can jump into and out of the water, and still be dry at the skin. Great when you’re in 40 degree F water. Not so great when you’re in hot, humid air. She really perked up after I was done, so I guess I did the right thing. And actually, I think she’s beautiful this way. Perhaps it’s just that she’s beautiful. But also, this is how she’s looked on most of our hunting trips, where she really shines. All her skill and talent comes out when looking for and retrieving birds for just the two of us. She’s in her element, and she’s beautiful. I did something today that I’ve wanted to do for a while, but didn’t have the conviction necessary to do it. Until today. This afternoon, I gave Carlin a very short “field dog” all over, including the topknot and ears. He looks like the other two did a month ago, and I hope he’s much more comfortable. 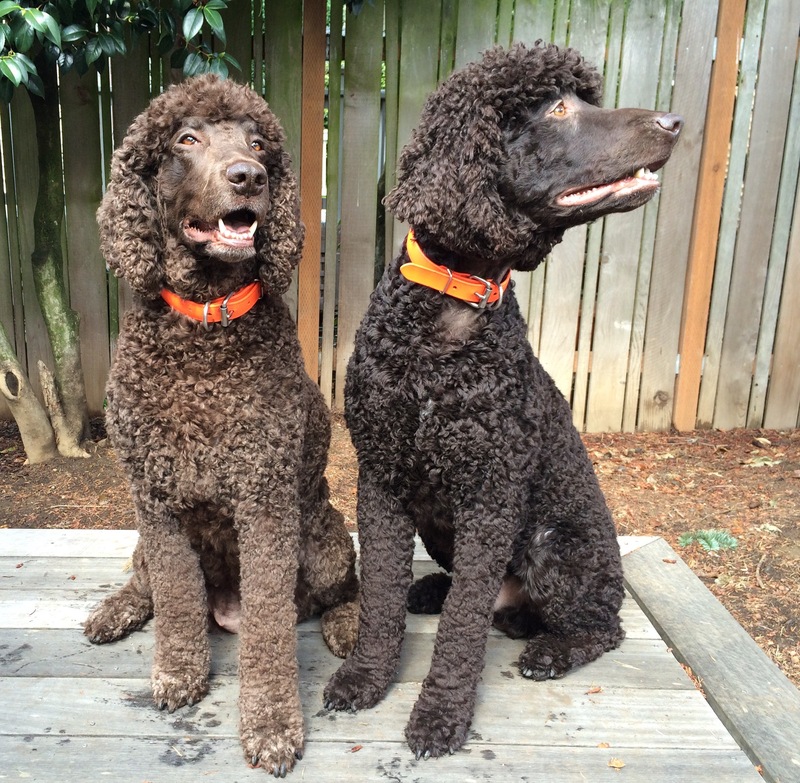 Russ with Tooey, Carlin, and Cooper in their field dog cuts. Carlin has been dealing with some health issue. We’re still not sure exactly what is going on (and we’ve been through many vets trying to figure it out), but one of its manifestations is that he feels hot all the time. He doesn’t have a temperature, but his breath is hot, his skin is hot, and pads of his feet are hot. He radiates heat. He pants much more than the the other two dogs, dries himself out panting, and then drinks a lot of water. He seeks out the coolest places he can find, like the bathroom tile floor and the dirt under the deck. And to top all that off, now in Portland, the weather is hot (in the upper 80s and lower 90s F). So, I today I took his coat down to about 3/4″ all over. All that lovely leg, topknot, and ear coat is gone. I feel relieved for him — I hope it helps him stay a bit cooler. And just touching him now, as he lies next to me as I write, his body does feel a bit cooler. But for myself, I feel guilty. I feel like I’ve let down the people who helped me over many months shape his coat into something that would impress a judge in the conformation ring. Soon I’m going to have to call his conformation handler, who had promised to show him in the big shows in August, and tell him that Carlin won’t be able to show. And I can’t forget what a more experienced IWS person told me many years ago when I wanted to clip Cooper. 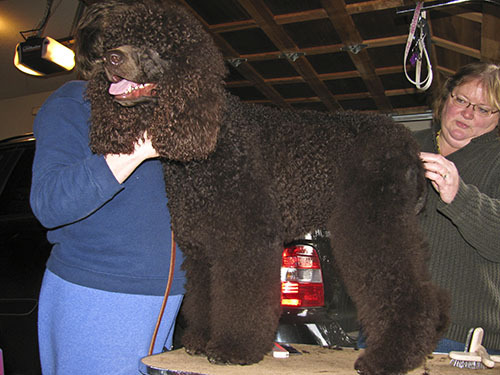 She said, “You have a coated dog, and there are certain responsibilities that go along with that.” So in cutting Carlin down, it almost feels like I’m letting the whole Irish Water Spaniel breed down. Which is ridiculous. Lots of people keep their IWS cut short, and they don’t feel guilty. There is no logical reason why I can’t do so, too. True, it will take a long time to grow out his topknot, ears, and leg coat. He for sure won’t be ready for the August shows, and he may not even be grown out enough for the January 2016 shows. But that’s OK. It will grow eventually. But even so, it appears that I’ve internalized some standard that is lovely in the ideal and necessary for a show dog, but just isn’t the best thing for Carlin right now. And somehow or another, I’ll just have to reconcile myself to what is right in front of me, right now. And do what I need to do to keep my dog as happy and comfortable as possible.